Happy Wednesday – how is your week going? In our house it is the week between the 11-hour days of marching band camp and the start of school. So for some bizarre reason I decided to do a ‘What I Ate Wednesday’ post. 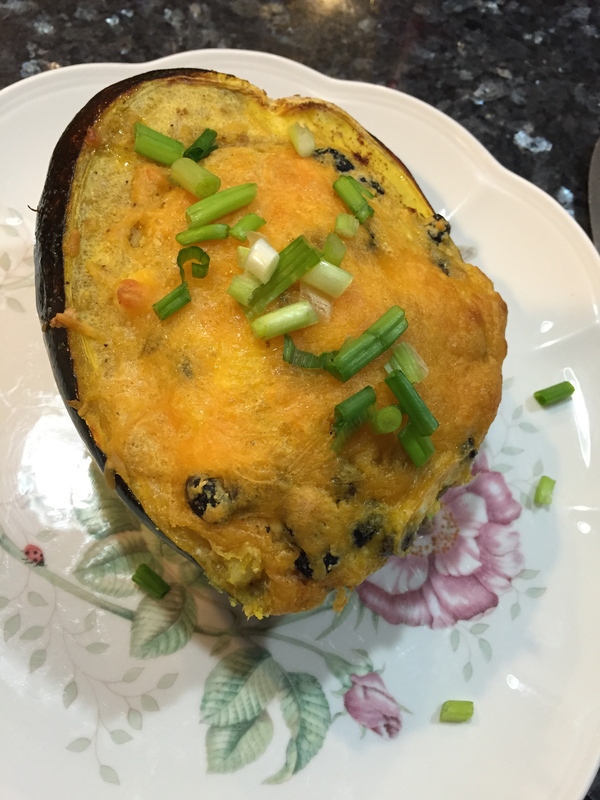 I never thought I would do one of these … but I wanted to share a ‘food day in the life’ … well, OK – I wanted to share a favorite recovery food recipe and the post looked really sparse! Haha – enjoy! Lunch at work seems to consist of brought-in or catered meetings more often than not. 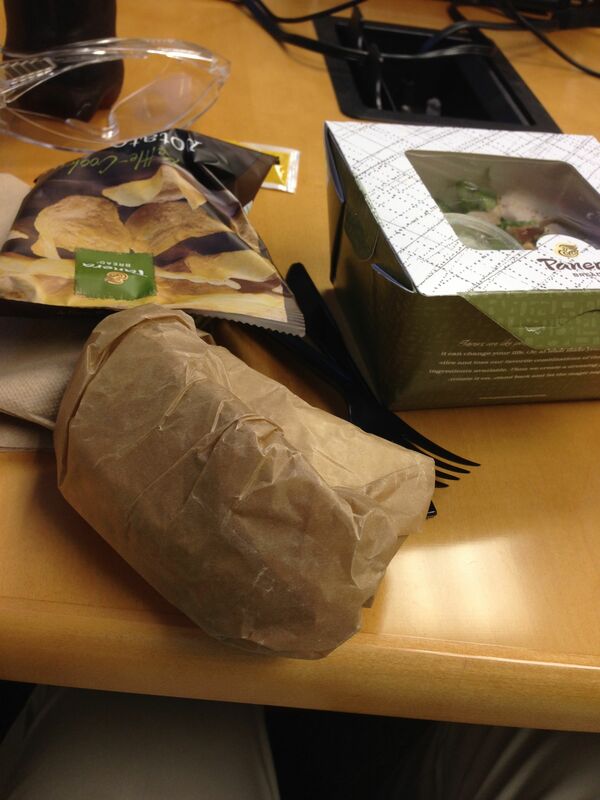 This week we have a visitor helping us with an important run, so for a meeting we had Panera Bread – salad and a veggie wrap. 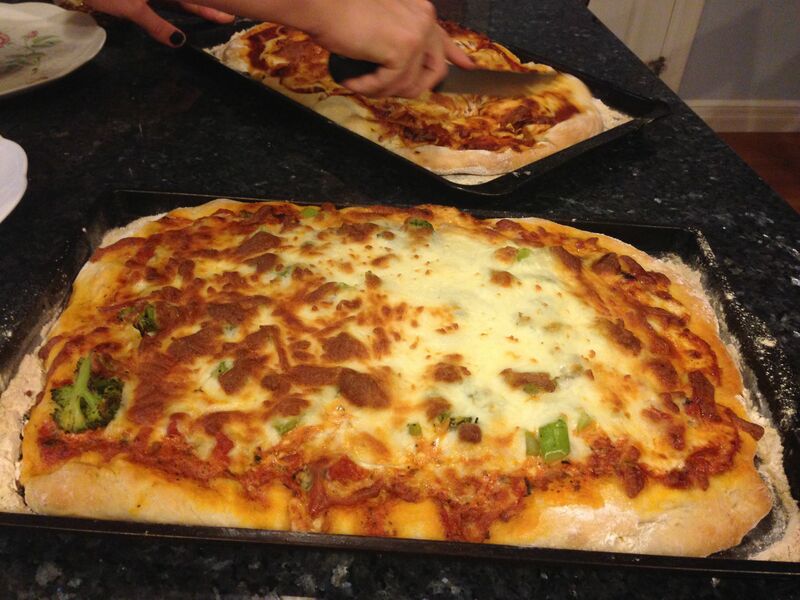 Make-your-own pizza is a fave – this is from last week, but was awesome! Happy endings? 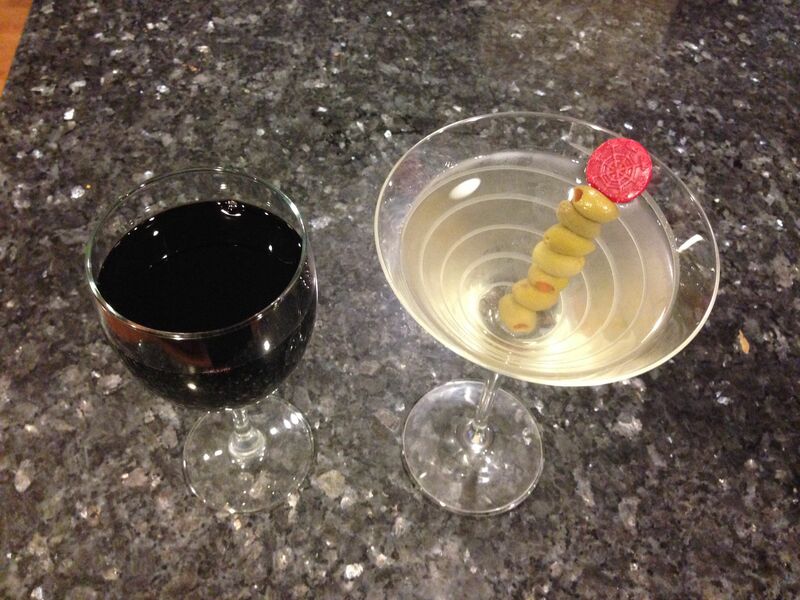 My red wine and Lisa’s Martini! Also, I have a great recipe I want to share – it is for a recovery treat I have enjoyed since I first found it two years ago. I can’t find the blog that referred to it, but the original recipe is here. 1. Bring cream just to a boil in a small saucepan. 2. Bash or chop chocolate into small chunks and place in a bowl. Add hot cream and stand for 5 minutes. 3. Meanwhile, line a loaf pan with parchment (or waxed) paper. 4. Stir cream and chocolate until smooth and well combined. Pour enough melted chocolate into the base of the cake to cover the bottom. (Optional 4a. microwave the butter for 20 second to melt, stir in peanut butter to thin, and then slowly combine in the confectionary sugar to make a fudge). 5. Place a layer of Graham Crackers on top. Cover with peanut butter (or peanut butter fudge). 6. Repeat until you go through most of the chocolate. 7. Add a final layer of Graham Crackers. 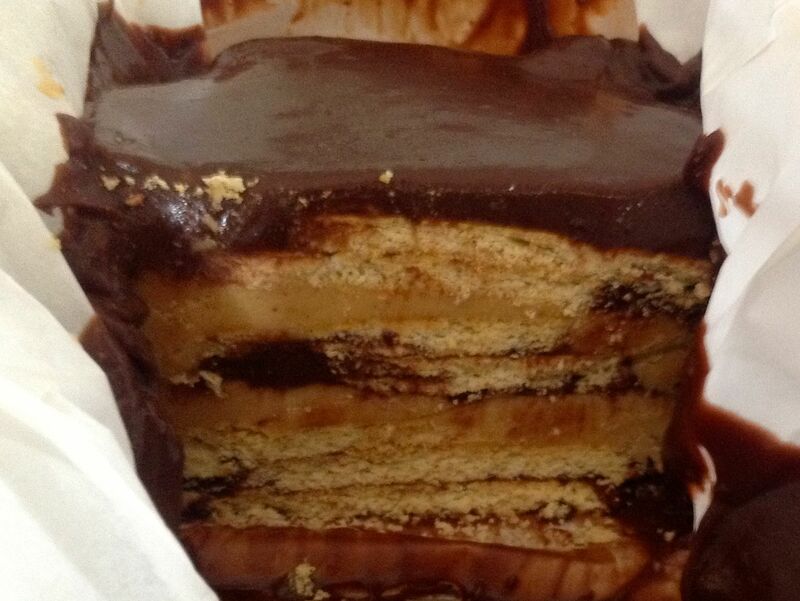 Drizzle remaining chocolate over the top. 8. Refrigerate (or freeze) for at least 8 hours, or longer if possible. 9. Slice thin – as you might expect this is super-rich and filling! – Dairy Free: Replace cream with almond milk or rice milk or coconut milk. Also replace milk chocolate with dark. – Sweet & Salty: add some sea salt flakes on top of the peanut butter layer. What is YOUR favorite decadent recovery food? Pinterest: so I was asking Olena at Candies & Crunches about her infographics after reading this post and she noted finding them on Pinterest. That hadn’t even occurred to me. I have a Pinterest account and do Pin things on occasion, but have just never connected. So I will ask you guys … what suggestions do you have for getting more engaged with Pinterest? OK, so here we go with another set of links I found interesting this week! 1. OK, this is totally meta, but here is a link to a set of links from Greatist. I like how they do round-ups, and this one is on ‘gender and feminism’ issues. There are several great links, looking at strategies for winning Oscars to ‘boyfriend-zoning’ to proof guys are more absent-minded (I still call it a cop-out!) and more. I really enjoyed all of the links (and the minutes just disappeared as I worked from link to link and so on). But there was ONE I really connected with – it is a VR syste, allows one person to see life through the perspective of another – male to female, black to white, short to tall. Be Another Lab takes a different, more visceral approach to exploring empathy. Instead of using digital avatars, the group uses performers to copy the movements of a subject: for example, racial bias is studied by having a subject’s actions mirrored by a performer of color. I know it is only an experiment, but the thought of allowing others to gain empathy through this type of things really intrigues me. 2. Here is a unique perspective highlighted at UpWorthy – Eat anything you want … just cook it yourself. The main theme is that the things fast food does best are often things that are laborious in small home batches – so we end up eating those things much more frequently than we would if we had to make them ourselves. The video is just a couple of minutes long and definitely worth watching. While we’re talking food, Greatist had another link list about ‘Odd Eating Habits’ … definitely some fun things including articles about using expired food for cheap meals, eating roadkill, how baby smells trigger the same brain centers as delicious foods, and more! Just because you’re fit doesn’t mean you’re healthy, or vice versa. Knowing the difference between the two will go a long way to a sustainable lifestyle. Racing or recreational running doesn’t intrinsically make one healthy. OK, so I lied … one more. 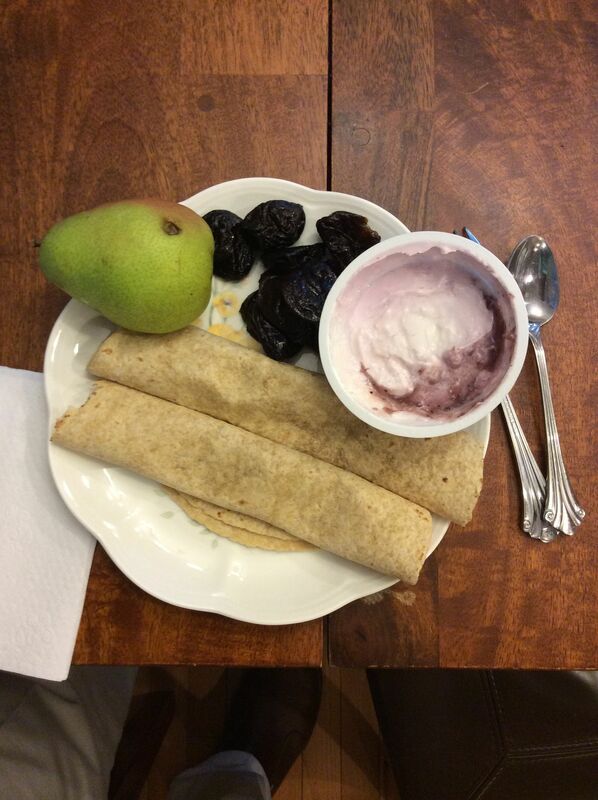 I have always talked about how my running regulates my eating – when I run, I automatically eat better. Turns out it is ‘a thing’ because … SCIENCE! A study highlighed at Runner’s World looked at what you craved after exercise compared to non-exercize. Cool! Definitely go check out the full article … and after reading I would bet that guys will start asking ‘WHY do you think you need to wear that’ and women ‘do I REALLY need to do this to myself’? 4. Parenting – exactly where are the boundaries? We have always been pretty strong with the boundary limits for our kids – look but don’t touch, no ‘visiting other booths’ at restaurants, and so on. But at the same time, we don’t pretend our kids were perfect (more than one full grocery cart was left behind over the years) – so when I see a kid who is a little fussy and the mom/dad is distracted by another fussy kid, if I can give a distracting smile, I certainly will. But there need to be some type of limits … and personally I think that climbing on art falls on the far side of that line. Thoughts? Not just about this – but what as a parent has changed in how you now view other kids, and as a non-parent what drives you nuts about parents and kids in public? Also on parenting, over at Neatorama, there is an amazing comic looking at the first year of parenting through the perspective of comic artist Grant Snider of Incidental Comics. 5. I used to be very quiet, but got better after losing weight … and now after moving to Corning Lisa says I am a total chatterbox who will talk to just about anyone! Yet I still dno’t have an issue with silence. I have no problems making smalltalk – do you? There was a cool article at LinkedIn highlighting a number of topics to use and avoid and approaches for small talk. Definitely check it out – especially if you hate making small talk but find silent moments uncomfortable. I have definitely dealt with this too many times through the year – people who absolutely need to be right, and have the situation corrected, politeness and decorum be damned. 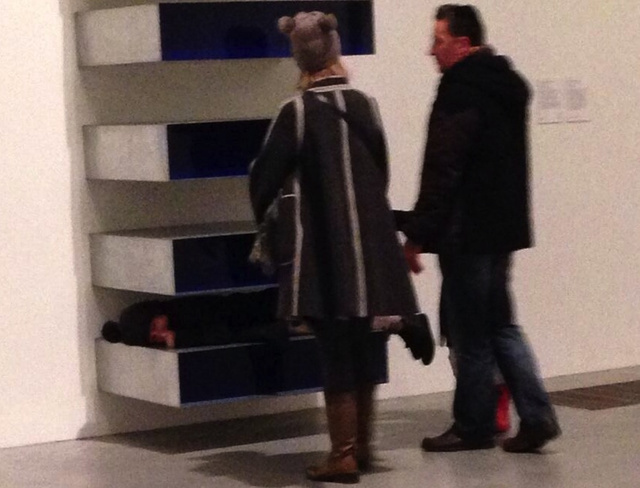 So … what did YOU find intriguing this week?